One day Ellen’s dad was given a little fireball sailboat with a small leak in the hull. He tried to fix the leak and joined a sailing club. Members of the club gave him lots of advice and suggested that he attend a class to learn the basics of sailing a boat with the power of the wind. 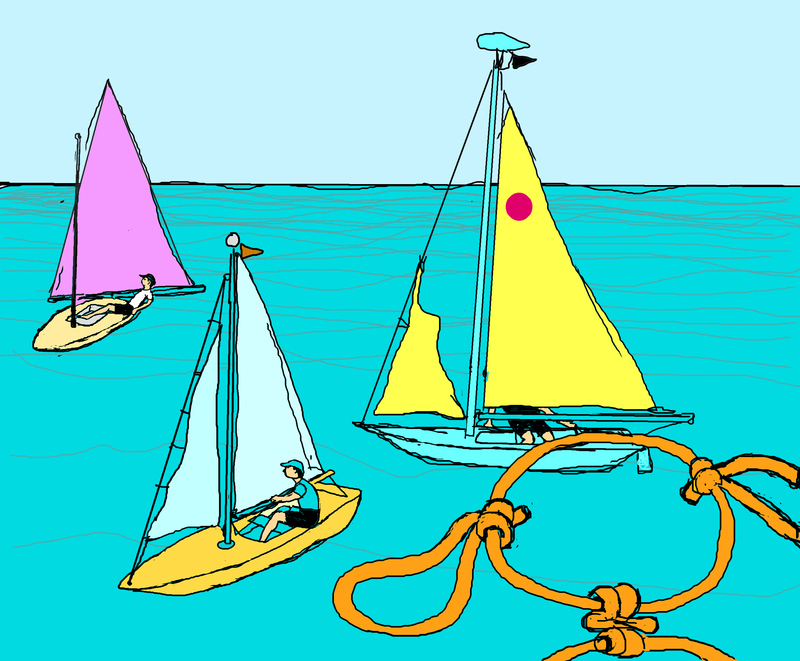 On the first day of the class, everyone met at the clubhouse where the instructor showed the new sailors how to rig all the ropes and cables on their boat and raise the sails. When everything was ready they launched three of the little sailboats. Ellen’s dad jumped into one of the boats, but Ellen and Wire Dog decided to play it safe. They just watched from the shore. The sailboats looked so nice as they cruised back and forth across the lake. Everything was going along just fine until a little storm blew in. The boats were too far out on the lake to get back to the shore in time to beat the storm. When the strong winds hit the sails, all three of the little sailboats tipped over in the water. Luckily everyone in the boats wore a life jacket so no one was in very much trouble even though they all got wet. The instructor had told all of the new sailors that these little crafts often tip over in strong winds and he had explained what they were supposed to do to get them upright again. Wire Dog and Ellen were worried as they watched from the shore. It wasn’t easy, but eventually all three of the little boats were up again and sailing for the dock. That night at home everyone wanted to hear the story over and over again. You should always wear a life jacket whenever you are in a small boat so that your boating stories can always have a happy ending.